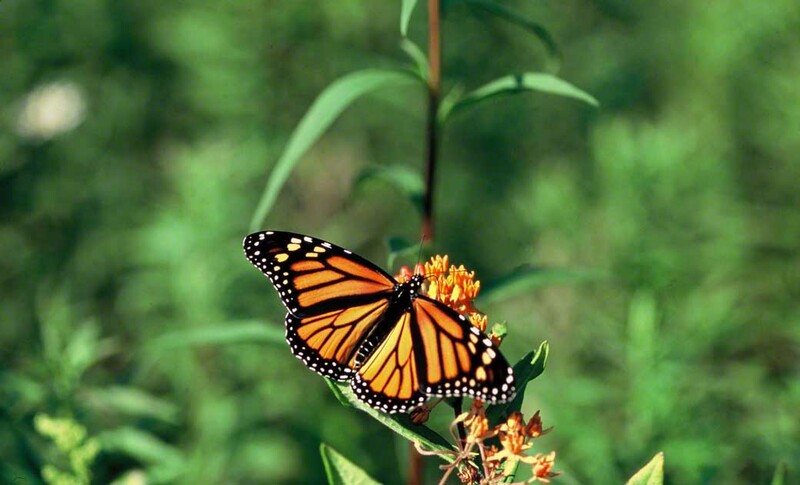 Monarch butterflies are on the mind of millions of Americans these days. Especially those of us east of the Rocky Mountain divide. Were the experts correct, had the monarchs wintering in Mexico nose dived to not 500,000,000, but way down to 33,000,000. Was the winter in those Mexican mountains, in the states of Michoacan and Mexico, free of lethal snow and ice storms? Were the monarchs able to bulk up on nectar in the wildflower fields abutting their roosts? And the follow-up Big question, Are they now in Texas and Louisiana? I have nearly completed Four Wings And A Prayer by Sue Halpern (Vintage Books, 2001) and it was a really good read. I know so much more about Danaus plexippus than I did before. I did not know much about Monarch Watch or Journey North, both serious websites, working to monitor, track and understand the Monarch phenomenon. If Texas and Louisiana serve up good weather, lots of Asclepias nectar and much luck, Monarchs descended from this female you see here will mate, produce viable eggs, caterpillars and chrysalis and that new generation will head north to . . . US! Yippee! Who amongst us, here on wingedbeauty, is not anxious to see that first monarch, flying in as beautifully as they do, to our town, garden, city, park, acreage? With our lives so complicated nowadays, who won’t bust-out with Joy! when that happy moment arrives in May, June or July? I mean the list is endless: Mississippi, Tennessee, Kentucky, Indiana, Arkansas, Illinois, Florida, Georgia, West Virginia, Virginia, South Carolina, North Carolina, Pennsylvania, Ohio, Illinois, Kansas, New York, Massachusetts, Rhode Island, Vermont, New Hampshire, Maine, New Jersey, all most of Canada. Have I missed any? A fine, beautiful July day in Rector, Pennsylvania. These Laurel Highlands are a destination for Fallingwater, Seven Springs, Bear Run, Ohoipyle, and the legions of the wealthy, who have long ago built their understated manses on generous acreage. Frank Lloyd Wright would have loved this refuge that we view here, rich with wildlife, more than 3,000 acres of it. Its margins gently give way to farmland and gentlemen’s farms, wonderfully ensuring a long, unchallenged future. The patrons of this area do not want change. Good for that. Of course I was here that entire summer to photograph butterflies . . . 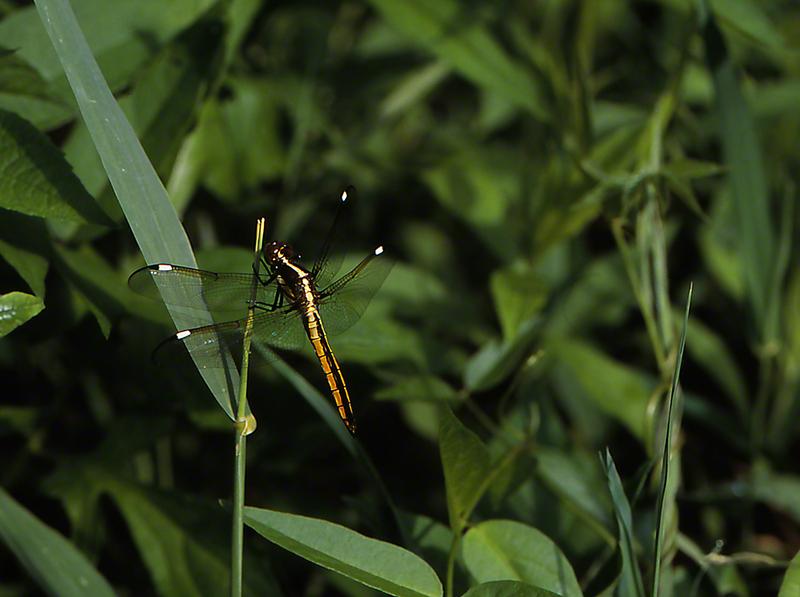 But, a spectacular darner, one who actually tolerates my approach, always serves as a siren for me. This Libellula cyanea typified Black-faced skimmers, as it rested just several feet from a healthy pond. This species perches much of the time. Not much to fret about . . . food plentiful, weather excellent, enemies? few, mates? sufficient, community? wealthy, protected and private. Well born, so to speak. Here at Raccoon Creek State Park, 35 minutes west of Pittsburgh (once the steel capitol of the world), they usually are first seen in June. They are not familiar to most people who encounter them. They almost never are seen nectaring on flowers. The females try to stay away from biggies like humans, and the males are most often seen taking moisture on trails. Watching hikers and strollers approaching these butterflies on a trail is fascinating. 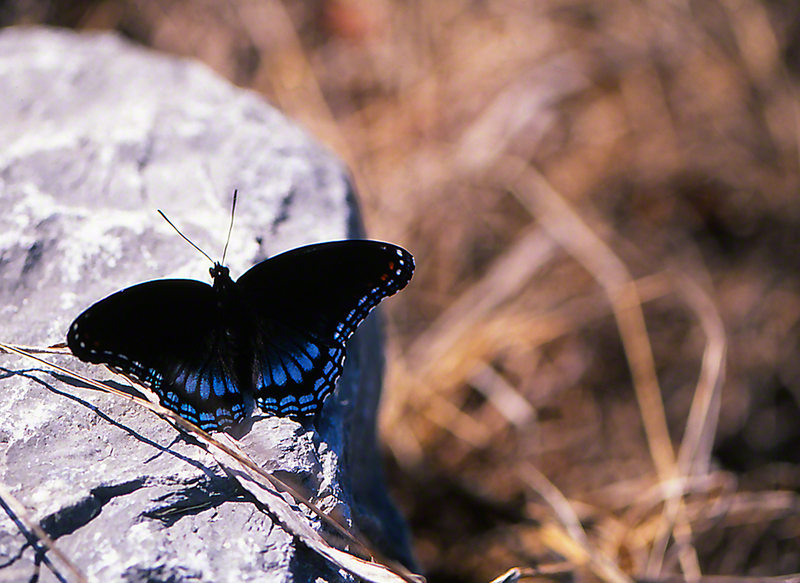 As they approach the Red-spotted purple, Average Hiker/Naturalist’s LOUD footsteps (vibrating through the substrate) trigger quick flight, and the butterfly usually flies low along the ground, some 20 feet or so uptrail. AH/Naturalist barely takes note of what has happened, and almost never follows the butterfly’s actions. I used to marvel over the Why? of this. Why don’t most people lock in on such a butterfly, and track its behavior? By now I’ve read many books written by a variety of butterfly enthusiasts, and I now am resigned to . . . that’s just the way it is. Most people don’t center their attention upon our winged beauties. For the record, a fresh, color resplendent Limenitis a. a. is among the most beautiful of all butterflies. This one here begins to support that thought. Wonderfully showing both upper and lower wing surfaces, its reds, oranges, whites, blacks and bluish/purples are spectacular. Years have gone by, and I’ve tried to score that argument with a drop-dead gorgeous image…. This one will suffice for the moment, it begins to transmit that message. Shot with Fuji film, not photo shopped…the colors are, how do say, Laurence? Paula? Revital? Ah, how few notice the sheer beauty of this local, one of the most attractive in a region full of lovely butterflies. Puzzle over how little recognition, respect our homegrown butterfly enjoys? NB, How does this butterfly get through this savage winter? As caterpillars, hidden away in the leaf litter covering the forest floor. Gives you a shiver, eh? War and Grazing Cattle . . .
Eran and I drove from Tel Aviv to Mt. Hermon, at the northernmost tip of Israel. We took the ski lift up to the top of the mountain. We watched as a pair of eagles flew past us, Wow! It was exciting to stand on the peak of Hermon! Israel, Syria and Lebanon stretched out this way and that. I prepared myself for this trip. I knew that the mountaintop was habitat for many rare butterflies. I was not disappointed. We have, and will soon share images of some of these rare, protected winged beauties. What I was not prepared for, was this. Huh? 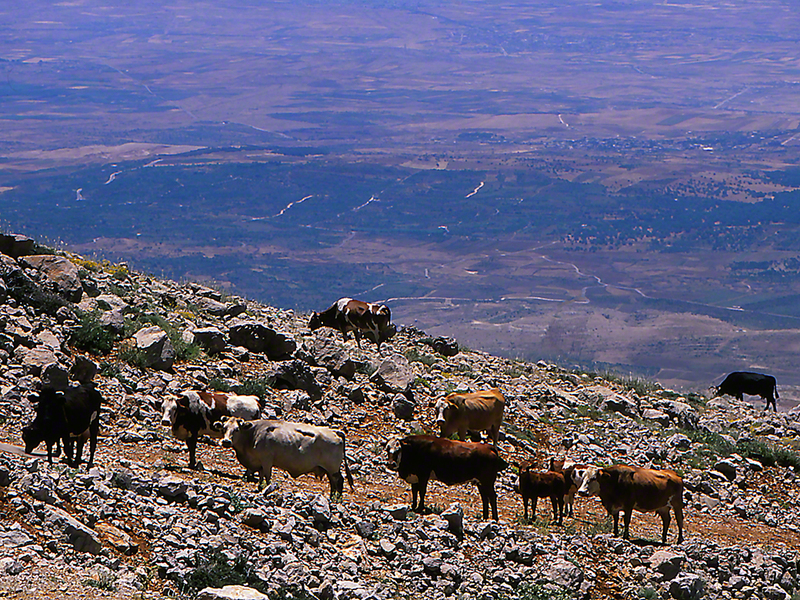 Cattle grazing on the mountaintop, 7,000. feet above sea level? Cattle no doubt owned by a Syrian farmer. Yet, no farmer in sight. It was 2008. Frieda A”H had passed in January. Standing on the peak of Hermon was good medicine for me. The kid from Brooklyn, who never knew of the ‘golden spoon,’ was soaking in the beauty, glory and blessings of the incredible top of Hermon. 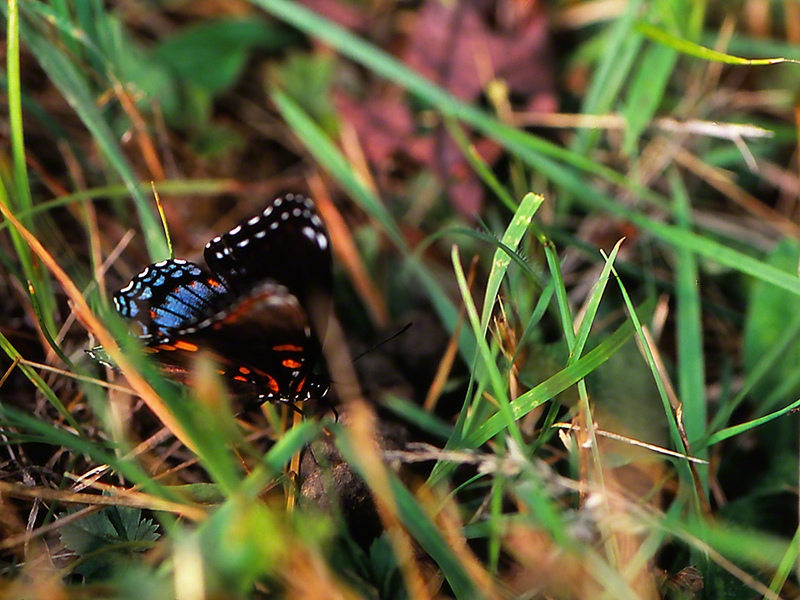 Yes, we found and photographed the butterflies of Mt. Hermon. You can see them amongst the butterflies of Israel. Some of them are unchanged, the same as they were when The Great Ones did their teaching. But…it’s now 2014. What’s become of the farmer who owned this cattle? Has he fled his Syrian farm, amidst the carnage that must be all around him? Are the offspring of these cows still grazing Hermon, or are they also victims of this madness? Pathetic! My first trip to Mississippi. We visited family in Greenville and bivouacked in Leroy Percy State Park, in nearby Hollandale. This was 2011, many years since I met a fellow soldier, Gywnn, who spoke fondly of Mississippi, as we killed time in our bunks at Ft. Sill, Oklahoma. But Gwynn was correct, Mississippi was a whole lot different from Brooklyn, New York, and from Pittsburgh, Pennsylvania. Flat for as far as you could see, alligators in the park’s lake, and chiggers! I sought butterflies throughout Leroy Percy Park, and on returning to our log cabin, itching, a sudden onslaught of itching, not just here, or there, but just about everywhere? I did see mosquitoes. Mississippi does not lack mosquitoes. This itching came from places that mosquitoes couldn’t have gotten to. And . . . I sprayed myself before I left, with Off! Back home, Off! is very effective. The Park Office hadn’t closed for the day, so I walked over there and asked the man and woman there about this almost unbearable itching (I’m starting to . . . itch). Immediate explanation. Chiggers! Tiny insects that get onto you in the high grasses. Our tough Pennsylvania winters make us chigger proof! Yay! for that. Limenitis arthemis astyanax here in central western Mississippi is remarkably similar to those that we have posted here, from Pennsylvania. Though more than 900 miles apart, they sure look like one another. Can you imagine that? Mississippi and Pennsylvania are so, so different. Their Red-spotted Purples are so, so similar. Cech and Tudor (Princeton University Press, 2005) notes that the red marks near the forewing apex are more visible in the females. Is our example here a male?